It’s strange, now, seeing it from this vantage point, but that June of 2010-the month that changed the course of history-offered hope and terror in equal measure, though none of us alive at the time were aware of just how significant and prophetic the events of that month would turn out to be. America was in a bad place. The economy, which had nearly collapsed two years earlier, was still struggling badly, and the political will to address its problems was lacking. The second marital separation of a Gore family member had shattered the nation’s faith in the stability of Gore family marriages. And, of course, there was the unstoppable flow of oil from the spill in the Gulf of Mexico. And yet, even at the darkest hour, there was one bright light that helped cut through the gloom: bros icing bros, that playful game where the forced consumption of horrible alcohol imbued our otherwise empty lives with a brief bit of purpose and gaiety. As the weeks wore on and the news brought no relief, Americans from all walks of life began to embrace the phenomenon. It was almost some sort of mass delusion in which society convinced itself that if everyone decided to participate in the icing our problems would mysteriously vanish and life would return to the normality we knew just a few years earlier. The icing craze really took off in the third week of June, when a four-year-old child actor named Davey Duncan was hired to appear in a skit on “Lopez Tonight” where he mischievously iced host George Lopez. His most popular line in the bit, “I iceded you! You’re iceded!” became a national catchphrase, and a YouTube clip of the appearance proved so popular that it brought the site down within two hours of its being posted. Celebrities immediately moved to cash in on the craze, with Chelsea Handler’s Ice to Meet You, My Name Is Chelsea becoming an immediate bestseller despite the fact that the book had a total of 97 words, many of which were its title and the names of the author’s previous works. Still, it was several hundred pages of Handler holding bottles of Smirnoff Ice in various seductive poses, and that was enough to make it a gigantic success with the public. NBC announced that it would air a sitcom about a modern family whose members were only able to express their love for each other through frequent (and increasingly complex) icings. “Ice My Ice Ices” brought the network back to first place in key demographics (although the success was short-lived after Davey Duncan, now five and playing the family’s youngest child, was forced to leave the show for rehab). Back on the Gulf, the situation remained dire. Oil continued to pollute the water and spread itself across the land. Every potential solution ended in devastating failure. It was at this moment that a young BP representative, hoping to add a little levity to another disappointing day, attempted to ice Coast Guard Admiral Thad Allen. Allen had been so focused on the crisis that the icing craze had completely passed him by. Confused and disgusted by the bottle of malt beverage being thrust in his face, Allen knocked it out of the BP man’s hand. It shattered on the hull of the ship in which they were standing. Then everything changed. It was true. 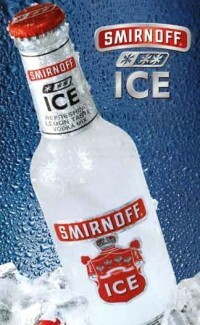 There was something about the chemical composition of Smirnoff Ice which made it absolutely toxic to oil. This was no mere dispersant; the ice completely eliminated any trace of the offending substance (the oil). Smirnoff factories sprouted up across the land, and unemployed Americans found themselves once more working in the manufacturing sector as they labored around the clock to produce enough Ice to save the fragile Gulf. With the success of “Operation De-Icing,” the Gulf was indeed saved, and nearly restored to its previous condition. Subsequent testing revealed that Smirnoff Ice, with a brief modification, could power internal combustion engines, removing the need for oil in the first place. As Ice became America’s number one producer product the economy picked up, improving the chances that President Barack Obama (whose famous speech, “It’s time to kick a little ice,” would be noted as the most stirring moment of his term) would be re-elected. In fact, going into the first debate of the 2012 general election against Republican presidential nominee Mitch Daniels, Obama lead the race by seven points among likely voters. However, when the two candidates met on the stage and were about to shake hands, Daniels-in what strategists later claimed was a move to lighten his stiff, humorless image-whipped out a bottle and attempted to ice the President. Obama’s team had expected such a scenario, and Obama was able to deflect the icing with an Ice of his own. Unfortunately, both campaigns had neglected to inform the Secret Service of these plans, and the resulting shoot-out left the two men dead. In an attempt to unite a fragile nation, President Biden and his Republican counterpart, Vice Presidential nominee Chris Christie (who had been put on the ticket over Daniels’ objections that the inevitable catering budget overruns would cast doubt upon his credentials as a fiscal conservative), held a joint press conference on the very Gulf where America had once again found its spirit. “We are here to show the world that we can still stand together,” said Biden. Christie, sweating profusely, was about to make his own remarks when a giant creature slithered out of the water and ate him whole. The Age of the Monsters had begun. There was not much that scientists of the time were able to experiment on during the chaotic winter of 2012. The Monsters were seemingly impervious to bullets, and the speed with which they would emerge, devour their prey, and then return to the murky depths made them impossible to capture. Researchers were only able to offer hypotheses about the origin of the beasts. What became the scientifically accepted consensus was this: The massive amount of Smirnoff Ice that had flooded the Gulf had somehow caused a mutation on the bivalves who had survived the spill, turning them into the gigantic monsters that were now plaguing the American South. A plan was drawn up by which Ice would go through a reverse osmosis procedure that might prove effective against the monsters, but failed to pass Congress after the Republican party complained about its cost (“Unfair to pass this debt to those of our grandchildren who don’t get eaten,” tweeted Senate Majority Leader Sarah Palin.) This opposition, combined with a campaign by prominent radio and television personalities to cast doubt on what they soon referred to as “Monster Science,” led to the plan’s abandonment (and, some say, caused Al Gore so much disappointment that he divorced third wife Olivia Munn). I write this from a secure compound in the Midwest. It seems that what we used to call Michigan causes extreme pain and revulsion in the Monsters, who avoid it, leaving it the last place on earth where humanity can still eke out an existence. I do not know how much longer our now tiny species can survive so I leave this historical record in hopes that it might provide information about a once glorious species that briefly controlled the planet and then died out as a result of its own folly. If you are reading this you will note that it has been weighed down to the desk by a bottle of Smirnoff. Guess what, bro? You are SO ICED. Drop and drink!